The Water's Edge Church in Omaha, NE | A Church for Everybody. WE are individuals and families. Neighbors and friends. WE welcome EVERYBODY and that means ANYBODY. WE are for our community. WE are for our city. WE are for Omaha. The Water’s Edge (WE) Church is located in West Omaha, NE. Our weekly services are held at at 9:00am and 10:30am on Sunday mornings. WE welcome families and individuals of all ages. New to The Water's Edge? We are so glad you found us and we would love to meet you! Get a few more details about visiting The Water’s Edge or getting connected within the church. Thinking about joining us this Sunday? We gather on Sunday mornings at 9:00am and 10:30am. Learn a little bit more about what you can expect when you arrive. Join us right here every Sunday at 9:00 AM and 10:30 AM for our Live Stream. You can also find us live on Facebook and YouTube. Any given Sunday. There are sports to watch. A gym to visit. Never ending work around the house. They all make their claim against worshipping in church. Not to mention the politics, the money, the scandals—sometimes church seems so far from Jesus that he would barely recognize it. Yet, on any given Sunday, God shows up. When we show up, the sacraments lead us to experience God and help us to understand each other. Things like baptism and communion and healing and serving will teach us about the power of God’s grace. 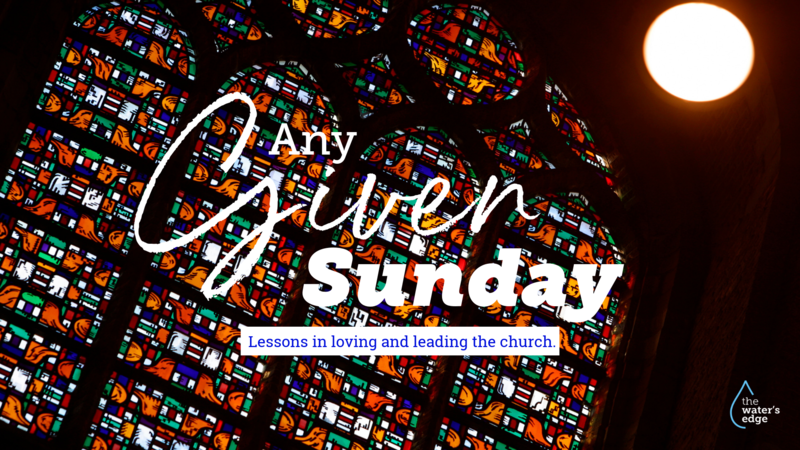 Church can be risky and it can be messy and it is far from perfect—but God still shows up—any given Sunday. Join us beginning April 28th for Any Given Sunday. Have questions about attending The Water's Edge? Looking for more information about our mission efforts or getting involved? Our team is happy to help!